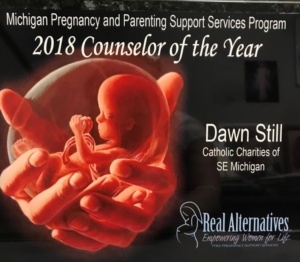 The following story is one of the reasons Dawn Still of Project Hope was recently recognized as Michigan Counselor of the Year by Real Alternatives. Amy also learned about the possibility of suffering post-partum depression so she could develop a plan with a therapist for after her baby was born. During her pregnancy, this young mother grew more and more confident and excited about her child’s impending birth. After the birth, Amy continued to receive support from Project Hope, learning to be a good mother to her newborn son. Today Amy is active in a mother’s support group. “She can’t imagine life without her baby,” said Dawn.